You can also lock or unlock the door and open the trunk from outside with the keyless transmitter. • To unlock the driver’s door, press this button once. (Hazard flasher lights flash twice.) To unlock the other doors, press this button twice within three seconds. • To open the trunk, press this button. • If you depress the panic button ( ) on the transmitter, the horn will sounds and hazard lamp will flash. Ignition key is in the ignition switch. The transmitter battery is discharged. The operational distance 15 feet (5 meters) is exceeded. The weather is very cold or when there are other vehicles or objects around the vehicle. When the transmitter does not work correctly, open and close the door with the ignition key. 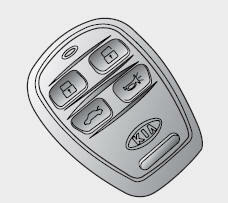 If you have a problem with the transmitter, contact an Authorized Kia Dealer.